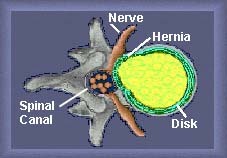 A herniated disc means that a fragment of the disc nucleus (nucleus pulposus), is pushed out thru a tear in the outer part of the disc (annulus fibrosus), into the spinal canal. This disc fragment then presses on spinal nerves, or the spinal cord producing pain down the leg. This produces a sharp, severe pain down the entire leg and into the foot. The space in the spinal canal is inadequate for the spinal nerve and the displaced herniated disc fragment. This results in pressure on the spinal nerve root or cord. The compression and subsequent inflammation is directly responsible for the pain and or numbness one feels down the leg, often called "sciatica." The direct compression of the nerve may produce weakness in the leg or foot in a specific pattern, depending upon which spinal nerve is compressed. The doctor may also note reduced or absent reflexes. A herniated disc is a well defined fragment of nucleus pushed out through a tear in the outer layer of the disc (annulus). For a disc to become herniated, it typically means that the disc is in an early stage of degeneration. Excessive weight, smoking, bad posture, and improper weight lifting are risk factors for degeneration and herniation of intervertebral discs. If this herniated disc fragment presses on one of the nerves, it will produce pain going down the leg, in the distribution of the nerve, and possibly in the lower back. Sciatic pain occurs when the disc presses one of the nerves that form the sciatic nerve. Other symptoms could be weakness, tingling or numbness in the areas corresponding to the affected nerve. Sometimes the patient may loose bowel and bladder control. This may present as urinary retention or incontinence and this needs to be handled as an emergency. Initial treatment of a herniated or prolapsed lumbar disk should be conservative. These include rest, analgesic and anti-inflammatory medication and in some cases physical therapy. At this point it is necessary to have some plain X-rays done, in search of some indirect evidence of the disk problem, as well as of degenerative changes of the spine. If these measures fail, the possibility of surgery (Laminotomy and Diskectomy) has to be contemplated. Prior to this surgery, some additional diagnostic tests that will show more detailed evidence of the problem, should be performed. These examinations could include the MRI (magnetic resonance imaging), and CT (computed tomography). These tests will show the disk, the space behind it and, the nerves. In some instances the EMG (electromyography) is also of great value, as this will show the functionality of the nerves and muscles.